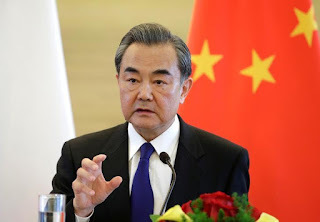 BEIJING (Reuters) - Chinese Foreign Minister Wang Yi urged all parties on Thursday not to heighten tensions on the Korean peninsula and said China had already clearly condemned North Korea's latest missile test. "Regarding North Korea's recent missile launch, once again in violation of UN Security Council resolutions, China has already clearly expressed our opposition," Wang told a news conference in Beijing. "At the same time, we also call on all parties not to take any actions that will lead to an escalation in tensions," Wang said ahead of regional meetings in Manila this week. On Saturday, Pyongyang said it had conducted another successful test of an intercontinental ballistic missile that proved its ability to strike the United States. U.S. Secretary of State Rex Tillerson, who will also attend the ASEAN Regional Forum in Manila, is expected to press China and other regional nations to take tougher action against North Korea. On Tuesday, Tillerson reiterated that Washington had sought to persuade North Korea to give up its missile and nuclear weapons programmes through peaceful pressure, and that it did not seek a collapse of Kim Jong Un's regime. Asked about those comments, Wang said China attached importance to Tillerson's remarks about the Korean peninsula and hoped the United States could implement them successfully. Wang said he hoped all sides could move forward together through dialogue to find a solution quickly that addresses each other's security concerns. China has signed up for increasingly tough United Nations sanctions against North Korea, but has also pushed for a resumption of dialogue and de-escalation by both Pyongyang and Washington. Tillerson's remarks showed "courage", said the state-run Global Times newspaper, usually known for its nationalistic bent. "Many Americans would think Tillerson is showing weakness, but we see his statement as the most courageous expression from Washington regarding the Korean peninsula issue," it said in an editorial on Thursday. "While (Washington) exerts pressure on North Korea, it should leave some alternatives for Pyongyang and make it believe that abandoning its nuclear and missile programmes will do more good than insisting on this path."